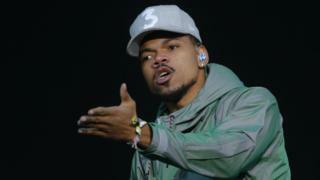 Chance the Rapper has branded an advert for a low calorie Heineken drink as "terribly racist". The ad, which the US star linked to on his Twitter, sees a bartender slide a beer past three black people before it stops near the hand of a lighter-skinned woman. As the woman picks up the beer, the tagline "sometimes, lighter is better" appears on screen. Heineken said it had "missed the mark" with the advert. The advert, which aired in the USA, New Zealand and Australia, was for a Heineken Light beer which has 99 calories. 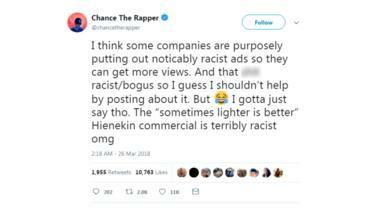 The 24-year-old rapper suggested some companies are purposely putting out "noticeably racist ads" ads to get more views. Some of his fans agreed. Not everyone thought the same.